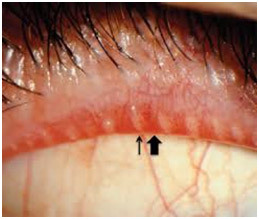 The Meibomian glands in the eye lids are responsible for secretion of lipid which protect the lid margins and prevent evaporation of the tear layer. These glands are under neuro-hormonal control(Sullivan et al., 2002) and are often affected by systemic medications such as hormone replacement therapy as well as Isotretinoin (commonly used in the treatment of acne), age and contact lens wear (Gannavarapu et al., 2017). MGD is the leading cause of evaporative DED (Craig et al., 2015), affecting almost 70% of the population in some parts of the world. 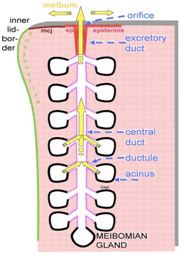 In MGD the glands become narrowed, acini atrophy and hyperkeratinise, and the meibum thickens reducing outflow (Craig et al., 2015). This encourages the proliferation of commensal bacteria such as staphylococcus aureus on the lid and around the gland orifices (Craig et al., 2015). It is well known that these bacteria secrete lipases that changes the composition of the lipids in the meibum secretion (Craig et al., 2015). The Meibomian gland openings become plugged, lid margins becomes irregular, thicker, hyperaemic (red) and telangiectasia (abnormal blood vessels) develop (Craig et al., 2015). The abnormal blood vessels secrete inflammatory mediators that over time damage the lid margins and ocular surface (Toyos et al., 2015). Conventional treatment of MGD include anti-inflammatory drops including steroids and cyclosporine, lid scrubs, heat treatment, omega-3, and oral antibiotics aimed atreducing the local bacterial load and pro-inflammatory cytokines. Despite these therapies, MGD management is often unsatisfactory (Toyos et al., 2015, Craig et al., 2015). Intense pulsed light (IPL) is widely used in the cosmetic industry as well as therapeutically for the removal of hypertrichoses, benign cavernous haemangiomas, benign venous malformations, telangiectasia, port-wine stains, and pigmented lesions (Raulin et al., 2003). The IPL devices emit polychromatic light from 515 nm to 1200 nm which is absorbed by the skin tissue as well as the targeted structure. This results in the production of heat (>80°C) which destroys the targeted skin lesions (Raulin et al., 2003, Craig et al., 2015, Toyos et al., 2015). The wavelength can be changed by filters to target different structures and control the penetration depth of the treatment (Toyos et al., 2015, Craig et al., 2015). The blood cells in the abnormal telangiectasia's absorb light, heat up and coagulate, finally closing the blood vessels. It is thought that as in the case of rosacea the secretion of inflammatory mediators is reduced by closing the telangiectasia's. Furthermore it is also proposed that 500 nm light also eradicate commensalbacteria improving MGD and DED (Craig et al., 2015, Toyos et al., 2015, Raulin et al., 2003). IPL seems to liquefy the abnormal viscous meibum secretion and dilate the glands facilitating gland expression by patients (Toyos et al., 2015). Studies have shown that IPL therapy led to improved tear break up times and lipid layer grades, as well as self-reported patient satisfaction (Craig et al., 2015, Toyos et al., 2015). Although increased meibum secretions are often seen after a single treatment, multiple treatments are usually recommended over several months (7 to 8 treatments per year) to improve MGD and DED. Treatment can cause mild discomfort and redness that can persist for several days before resolution. Adverse effects include blistering (red spot lasting <1 week), cheek swelling, conjunctival cysts, floaters, hair loss at the brow and forehead, light sensitivity, and redness of the face. In most cases the adverse effects self-resolved within 1 week (Toyos et al., 2015). Although IPL therapy results in improved meibum secretions and patient symptoms, expression of the Meibomian gland in conjunction with the therapy is recommended to maximize results. In future IPL therapy may evolve into a Botox-like procedure that requires consistent reapplication to maintain effect. CRAIG, J. P., CHEN, Y. H. & TURNBULL, P. R. 2015. Prospective trial of intense pulsed light for the treatment of meibomian gland dysfunction. Invest Ophthalmol Vis Sci, 56, 1965-70. GANNAVARAPU, R., SWARNA, S. & MAHADEVAN, R. 2017. MEIBOMIAN GLANDS AND DRY EYE SYMPTOMS: A pilot study compared the structural changes in meibomian glands and dry eye symptom scores in daily soft contact lens wearers. Contact lens spectrum, 32, 36,38,39. RAULIN, C., GREVE, B. & GREMA, H. 2003. IPL technology: a review. Lasers Surg Med, 32, 78-87. SULLIVAN, B. D., EVANS, J. E., CERMAK, J. M., KRENZER, K. L., DANA, M. R. & SULLIVAN, D. A. 2002. Complete androgen insensitivity syndrome: effect on human meibomian gland secretions. Arch Ophthalmol, 120, 1689-99. TOYOS, R., MCGILL, W. & BRISCOE, D. 2015. Intense pulsed light treatment for dry eye disease due to meibomian gland dysfunction; a 3-year retrospective study. Photomed Laser Surg, 33, 41-6.